Bank of England Governor Mark Carney has broken new ground by linking U.K. interest rates to unemployment. The Bank of England said Wednesday it would not raise interest rates until U.K. unemployment falls to 7%, a level it doesn't expect to see for about three years. 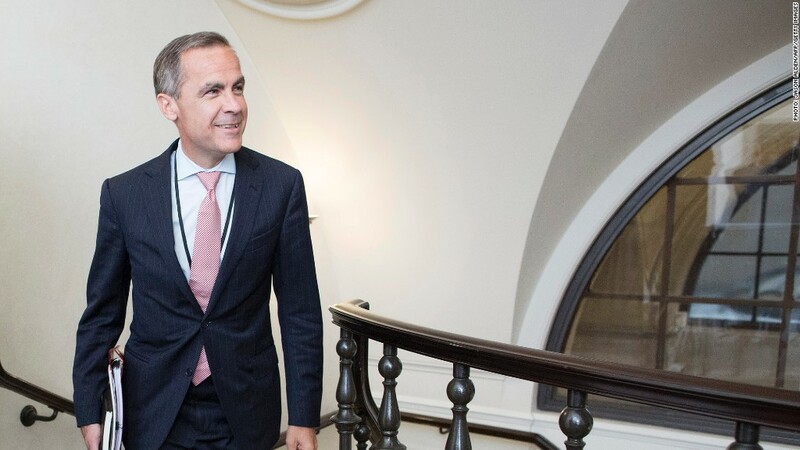 Issuing detailed "forward guidance" on monetary policy for the first time under new Governor Mark Carney, the central bank said it wanted to avoid a premature rise in market rates of interest -- the cost of borrowing for businesses and consumers. That would risk choking off the recovery in the world's sixth biggest economy, which has accelerated in recent weeks. "Our biggest concern at this stage ... is the possibility that as the recovery gathers pace there is an unwarranted change in expectations about the pace of withdrawal of monetary policy stimulus," Carney said at a news conference. The Bank of England increased its forecasts for economic growth in 2013 to 1.5% from 1.2%, and for each of the next two years. It has held official interest rates at a record low of 0.5% since March 2009 and spent £375 billion buying government bonds to help stimulate the economy in the wake of the global financial crisis. Sterling strengthened after an initial fall, U.K. government bond yields rose and stocks weakened. Investors were betting that the flow of positive economic news means that the unemployment threshold could be reached sooner than expected, or that medium-term inflation targets may be missed -- one of three "knockouts" Carney said would make the guidance invalid. "Every month of strong employment growth now carries the potential for market rate expectations to get pulled forward," said Philip Rush, U.K. economist at Nomura. "And that is before considering any of the three ways that guidance might be exited early." Carney said the recovery in activity was broadening but was still the slowest on record. Economic output would not return to its pre-crisis levels for another 12 months, and there were still one million more unemployed. Unemployment currently stands at 7.8% and the U.K. will need to create another 750,000 jobs for the bank's 7% threshold to be reached. Carney said reaching 7% unemployment rate would not automatically mean interest rates would rise. It was the level at which the bank would begin to consider removing some of its exceptional stimulus measures -- including the £375 billion in asset purchases. And it may even increase its quantitative easing program if the pace of the recovery is slower than expected. Assuming policy remains unchanged, the bank expects inflation to fall back to its 2% target just over two years from now. The U.S. Federal Reserve and European Central Bank have also used "forward guidance" to manage expectations about the future path of interest rates. The Fed won't increase rates until U.S. unemployment reaches 6.5% while the ECB has said rates will remain at current record low levels for "an extended period". Talk that the Fed may begin reducing the size of its asset-purchase program as early as next month has unsettled investors this week, with stock markets falling back from recent peaks.